Ok, are you ready? There's a lot of info. Time: You really need to set aside about 3 hours to make these, start to finish. For a girl's camp, at least the ones I've been too, that's a lot of time. 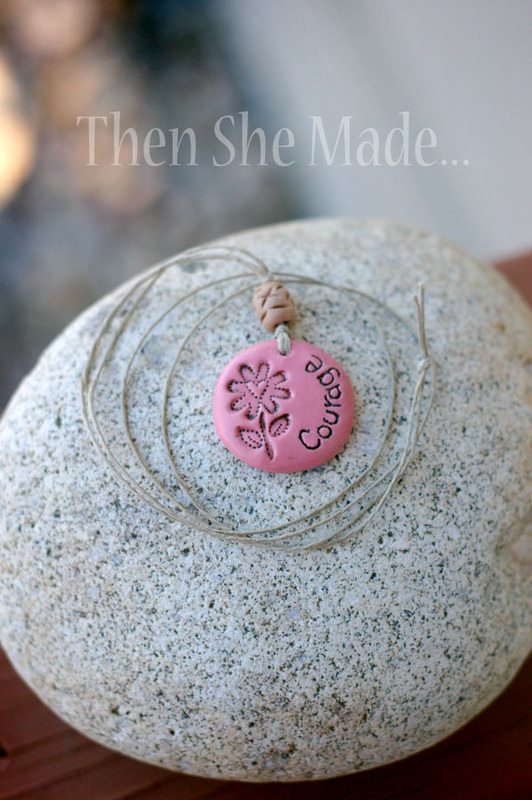 You need to leave time for sculpting, stamping, and cooking the clay. You need time to let the cooked clay cool, then time to paint, time for the paint to dry, time to seal them, time to dry again, and then finally you need time to turn the pendants into necklaces. If you try to rush the girls, it won't be successful. And, every girl will work at a different pace. Practice: Do not even attempt to make these at camp without making them for yourself first. You might make them and realize that they are more involved than they look. You also might make them and then love them and want to make tons of them. Either way, at least you'll have hands on experience and will be able to make an educated decision. Organization: In order for this craft to be done successfully, you need to be highly organized. If you want the girls to do these start to finish, I highly recommend having everything ready and in small little kits. Include everything from flattened clay to pre-cut hemp for the necklace. It will take more prep time for you but the results will be worth it. I recommend flattening out little mounds of clay for each girl. Once they are flattened you can store them in between two pieces of wax paper. Doing this ahead of time will save a ton of time with the girls. I found that the girls had a hard time flattening out the clay and making it even. This was really frustrating for some of them. Also, it will save you on clay expenses too. When I let the girls break off and condition their own clay, there was a lot of clay wasted. Plus, some girls made their clay really thick which didn't work very well when you turn it into a necklace later." Stamping: Stamping the clay is not hard. It's probably one of the easiest parts, however, remind the girls to press hard enough to make a good impression, but light enough that they don't push all the way through the clay. Aim for a good happy medium. Word Placement: By far writing the word on the clay was the hardest thing for the girls. Some of my girls just couldn't do it and got really frustrated with it. I've had other adults complain about this too. You will have girls that will just give up at this point. I've done many of these so I'm used to it but for a first timer, it's hard. To avoid the frustration you could do a couple of things: 1- skip the word completely and just stamp a design. Or, 2- have them put the word on the back of the pendant where it won't show. That way if it isn't perfect, they won't care as much. Cost: I get asked a lot about cost. If you are careful, you can get about 8 pendants from one small block of clay. That's if you separate out the sections before hand. If you let the girls break off their own, you will only get about 5 per block of clay. The circle cutters can be bought at craft stores but come in a pack of three different sizes for about $2. You only need the middle size and if you have a large group of girls you will want to have more than one cutter on hand. Paint is pretty cheap, one bottle will go a long way. Hemp can be bought at Walmart in a large spool for around $6 and will go far. Expectations: Expect different levels of artwork from the girls. Plan ahead that they will compare their work and some will get discouraged. This is life but since it is at a girl's camp where you want positive feelings, be prepared to give lots of pep-talks. I've done these with several different groups of girls. Some of them young, in activity days and some in Young Women's. Interestingly enough, the young women gave up first. Most will try but you will have a few that will just give up. 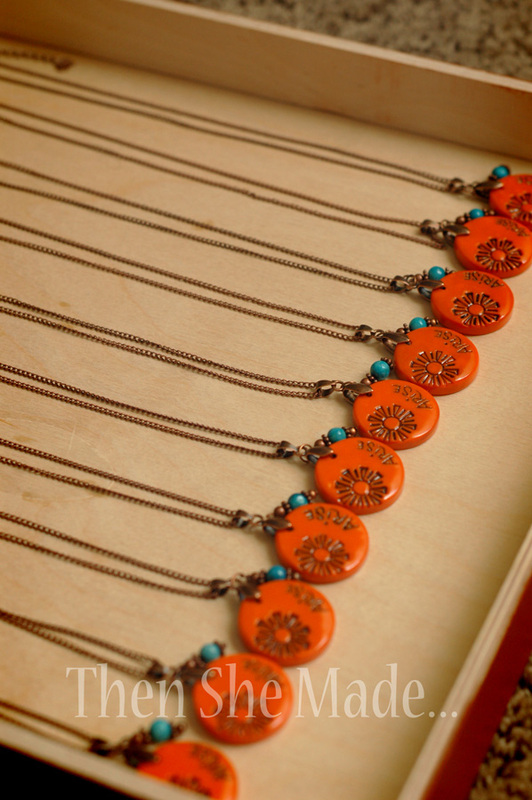 It might be wise to have some pre-stamped/pre-baked pendants on hand for those girls. That way they can still paint them and have something to turn into a necklace. Plus they will leave happy. These pendants aren't hard but they do require some patience and time to get them right, lots of girls will come into the craft expecting instant results and these don't work like that. Paint: Don't use black! For some reason black paint stains the clay and will not come off as easily. Use a dark brown instead. Also, and this is important, stress to the girls that they need to get the paint off as QUICKLY as possible. Put it on, wipe it off! Fast. You pendant won't look good if the paint stays on the pendant for a long time. A short cut idea: Lately when I've done these with groups, I've done all the beginning steps in the process ahead of time. It's more work for me, kind of, but it's worth it. So, when the group starts to craft, we start with a pre-stamped and pre-cooked pendant. The girls then paint it, seal it and turn it into a necklace. I'm not sure how you feel about making 150 pendants ahead of time but if you can do it, I'd recommend it. Then you don't have to worry about the girls getting frustrated, wasted clay or needing to bake them at camp. Also, it's helps cut down the time too. And, the girls won't need as much hands-on help, which in a large group, that is huge time & sanity saver. Instead, the girls just get to do the fun part and almost always will leave happy. After all this info, probably the best advice I can give is to just practice, practice, practice. Do them yourself and make sure you still love the craft. Make sure you can teach the craft. And make sure that you get the results you want in the time you have available. If not, save these for a mid-week activity with a smaller group and find something else to do at camp. Oh, and if you do make them at camp, I'd love to see the results - shoot me a pic and will do a little gallery of sorts. Amy, I did this with my girls. I bought white here http://www.walmart.com/ip/Sculpey-Original-Oven-Bake-Modeling-Clay-White/19212225 and spray painted them yellow. (I couldn't find yellow and was in a pinch.) It actually spray painted very nicely and I didn't have a problem with the paint running and making a mess with the letters and stamping. I did a light coat on the front, let it dry a little, then the back. If you have time to let it dry 2 days before you do the dark brown paint I'd do it. Amy, thanks for this GREAT idea. I have practiced and read through everything. Just wondered if you could tell me about the size of the 2 pendants you have pictures of and where did you find the necklace portion (chain) for the "arise" beads? Thanks again, sure appreciate the idea. (I'm good at copying others REALLY good ideas)!